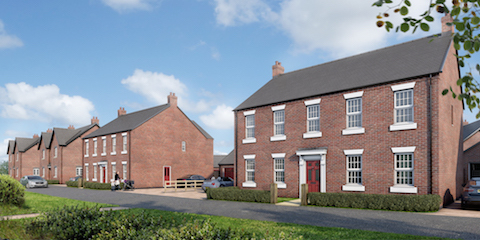 Derbyshire-based housebuilder Peveril Homes has submitted a reserved matters planning application for a new development in the village of Kirk Langley on the outskirts of Derby. The development site received outline planning consent in May this year, for 30 new homes off Ashbourne Road. The application consists of a mixture of 2, 3, 4 and 5-bedroom properties, as well as a range of bungalows and nine affordable housing plots. A new puffin crossing will be installed on the Ashbourne Road to improve safety for new and existing residents. As part of the developments Section 106 obligations, Peveril Homes will be contributing £174,35.54 to the education sector within the local community. The location off Ashbourne Road is just a 12 minute drive from Derby city centre and is conveniently located off the A52 – a major route connecting Derby and Nottingham and ideal for commuters needing access to the wider East Midlands, the M1 and East Midlands Airport. The new site will also sit on a major bus route – providing easy access to the city of Derby with its range of popular retail and leisure facilities, cafes and restaurants. Peveril Homes Director James Smith, is delighted to see planning submitted for this new development which will see a range of attractive new homes built within a popular Derbyshire village location, “This development will deliver all the hallmarks of quality and craftsmanship associated with Peveril Homes whilst appealing to a range of buyers through a mixture of house types ideal for upsizers, downsizers and first-time buyers,” said James. “Kirk Langley is a perfect location, offering country living within a short drive of the thriving city of Derby and conveniently located close to several major transport links. We are anticipating to start construction on this new development in early 2019.” added James. He continues, “This site is a perfect example of the sort of development Peveril Homes looks for – with scope to redevelop a prime piece of land and make a significant difference within the local community,”. “We continue to work closely with local landowners to ensure that land is utilised effectively, as we maintain our commitment to building quality new homes in desirable areas. We always welcome enquiries regarding land for sale and are open to discussions with potential vendors.” added James.